"Take your taste buds on a wild joyride to old Mexico with this hot, creamy dip. 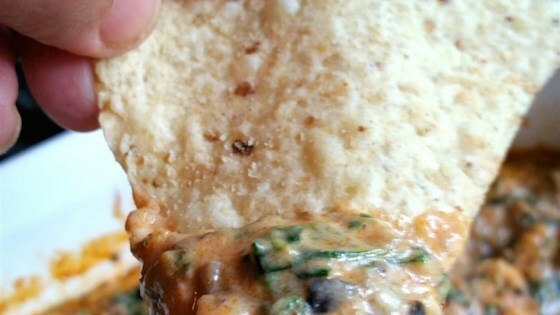 Spinach, salsa and Monterey Jack cheese are blended in a harmonious flamenco of flavors that's great with tortilla chips." In a medium baking dish, mix together salsa, chopped spinach, Monterey Jack cheese, cream cheese, evaporated milk, black olives, red wine vinegar, salt and pepper. Bake mixture in the preheated oven 12 to 15 minutes, or until bubbly. Huge hit at our Superbowl party! The taste is great but I agree with the other reviewers that it needs hot salsa and omit the evaporated milk.